Shingle roofing is by far the most popular option when looking into repairing your roof. A large percentage of homes in North America are outfitted with shingle roofing due to its versatile design and affordability. We understand that replacing or repairing your roof can be an intimating project. Let the team at Whitrock Associates assist you through the entire process. Thanks to a variety of types and colors of shingle roofing, you are more than likely to find one to compliment your home. Your team at Whitrock Associates Inc. II can assist you in all your shingle roofing needs whether it’s in our local city of Fort Walton Beach or Destin. We specialize in new roof installation, re-roofing, and roofing repair. Whitrock Associates also has the experience and knowledge for commercial and residential jobs. Our services include a variety of applications, inspections, and budgeting that our shingle roofing Destin customers have come to rely on. We understand that every customer has specific wishes when it comes to your new roof and we strive to meet those particular needs. We are your top shingle roofing Destin contractors when it comes to the process of installing or repairing your new roof. 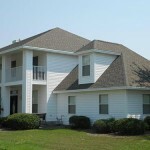 Contact us and let us surpass your expectations for shingle roofing Destin.